Ian Klinke is an Associate Professor in Human Geography and Tutorial Fellow at St John's College. Before joining the School of Geography and the Environment as a postdoctoral research fellow in 2013, he held positions in political geography at University College London (UCL) and Queen's University Belfast (QUB). Ian's PhD (2011) and MA (2007) were obtained at UCL. His undergraduate is from Maastricht University (2006). Situated within political geography, Ian's work has focused on three interrelated areas: the tradition of German geopolitics, the material landscapes of the Cold War and the geographies of European (dis)union. Posing both historical and contemporary questions, his research combines an interest in critical social theory with multi-method empirical work. 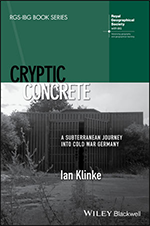 Ian's 2018 book Cryptic concrete: A subterranean journey into Cold War Germany sheds new light on the history of geo- and biopolitics through an analysis of the strategic discourses and physical architecture of nuclear war in early Cold War West Germany. A German translation of Cryptic Concrete book will appear in 2019. More recently, Ian has worked on the controversial German geographer Friedrich Ratzel (1844-1904) and the revival of geopolitical thought in 21st century Germany. Ian has given invited seminars across Europe, North America and Asia and has spoken at events organised by Chatham House, English Heritage and the Scottish Parliament. 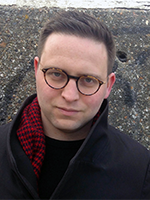 He co-edits a book series with Jason Dittmer (UCL) under the title Geopolitical Bodies, Material Worlds. Ian contributes to a number of Prelims and FHS courses and convenes a third year option entitled 'Geography at war'. He supervises DPhil students on a variety of topics and would welcome further doctoral projects in the following areas: geo- and biopolitics, Cold War architecture, thinkers of war and space, the history of German geography, contemporary German politics. Klinke, I. and Garrett, B.L. (forthcoming) ‘Opening the bunker: Function, materiality and temporality’. Environment and Planning C.
Klinke, I. (2016) Self-annihilation, nuclear play and West Germany's compulsion to repeat. Transactions of the Institute of British Geographers, 41(1): 109-120. Klinke, I. (2016) The Russian Cyber-Bride as Geopolitical Fantasy. Journal of Economic and Social Geography, 107(2): 189-202. Klinke, I. (2015) Commentary: Area studies, geography and the study of Europe's East. The Geographical Journal, 181(4): 423-426. Klinke, I. (2015) European integration studies and the European Union's Eastern gaze. Millennium: Journal of International Studies, 43(2): 567-583. Klinke, I. (2015) The bunker and the camp: inside West Germany’s nuclear tomb. Environment and Planning D, 33(1): 154-168. Klinke, I. (2013) Chronopolitics: a conceptual matrix. Progress in Human Geography, 37(5): 673-690. Klinke, I. (2013) What is to be done? Marx and Mackinder in Minsk. Cooperation and Conflict, 48(1): 122-142. Klinke, I. (2012) Postmodern geopolitics? The European Union eyes Russia. Europe-Asia Studies, 64(5): 929-947. Klinke, I. (2011) Geopolitics in Germany: the return of the living dead? Geopolitics, 16(3): 707-726. Ciuta, F. and Klinke, I. (2010) Lost in conceptualization: reading the "new Cold War" with critical geopolitics. Political Geography, 29(6): 323-332. Klinke, I. (2017) Security. In, Richardson, D., Castree, N., Goodchild, M., Kobayashi, A., Liu, W. and Marston, D. (eds.) The International Encyclopedia of Geography: People, the Earth, Environment and Technology. Wiley-Blackwell, Oxford. ISBN: 9781118786352. Klinke, I. (2016) The German in the Kremlin: the rise and fall of German Eurasianism. In, M. Bassin and G. Pozo (eds.) The politics of Eurasianism: Identity, popular culture and Russia’s foreign policy. Rowman and Littlefield International, London. pp. 301-317. Klinke, I. (2015) European geopolitics after the crisis. Geopolitics, 20(2): 479-483. Klinke, I. (2013) The geopolitics of European (dis)union. Political Geography, 37: 1-4. Klinke, I. (2016) Review of Claudio Minca and Rory Rowan: On Schmitt and Space. Environment and Planning D: Society and Space. Klinke, I. (2012) Review of Jeremy Black: Geopolitics. Millennium: Journal of International Studies, 41(1): 154-156. Klinke, I. (2011) Review of Martin Müller: Making great power identities in Russia. Political Studies Review, 9(1): 90. (2015) Why Germany's decision to join the fight against Islamic State is so significant - and misguided. The Conversation. (2014) NATO's nuclear relapse. Al Jazeera. (2014) NATO: the alliance that should have been dissolved. Al Jazeera. (2014) Geopolitical passport. Exploring Geopolitics.